Nut-free holiday cookies: you'll find the recipe in this post. Read on. One holiday down, a few more to go! Holiday time is very busy for all of us, so I wanted to share some of my most popular holiday posts in a sort of "roundup" blog post. I've included links to posts on nut-free holiday candy you can find at the supermarket, recipes for nut-free treats and holiday party tips that allow you to have a safe and healthy time with food-allergic family members. (Also see the post just before this one for info on navigating those holiday dinners with food allergies). Food allergies can be very stressful at the holidays and sometimes we feel like we have to attend every party and event, even if we know it will be difficult. Depending on how close you are with the hosts and the strength of your interest in attending the party or event, go easy on yourself. If you want to skip something, it's OK. I don't advocate avoiding everything, but the amount of social demands this time of year can be overwhelming, and if you are a family dealing with food allergies, it can feel impossible to keep a kid safe at some of these things. So, use your judgment and have fun is my motto. A word about candy, especially chocolate: labeling laws do NOT require "may contains" language or "processed on equipment with" language. Some companies may choose to put that information on a label, but it is, at this point in time, voluntary. So if you pick up, say, a chocolate in the shape of the "Frozen" characters and it has no warning for cross-contact, "may contain,", etc, that doesn't necessarily mean it is safe. Call/e-mail companies if you need additional information. If you can't find out the info, then use the links in this post for some safe nut-free suggestions. But remember: ingredients labels/manufacturing procedures can change and frequently do. Be an informed consumer and read labels, even if you see the item featured here. I also want to give a thank you to Nutphree's and Surf Sweets, two nut-free food makers who are currently sponsoring my blog. Their products are delicious, high-quality, NUT-FREE always, and available in some supermarkets and specialty stores, making them a great resource for nut-free holiday treats. Nutphree's has its owns storefront in the Chicago suburbs, so check it out. Surf Sweets is also available online. On to the nut-free holiday article roundup. Click each link to go directly to the article. For general nut allergy information, especially for those of you new to dealing with this issue, my e-book, The New Nut-Free Mom: A Crash Course in Caring for Your Child with Nut Allergies is a concise, compassionate resource. You can find out how to get it by clicking this link. Your readership and kind comments mean the world to me! I'm so glad that this blog is a helpful resource for so many of you. As this year draws to a close, I wish all of you a wonderful, safe, happy, healthy holiday with your children and families!! Just before Halloween, I read a post on a local parenting magazine Facebook page that went something like this: "I'm concerned about Thanksgiving and I need advice. My two-year-old is severely allergic to nuts and my mom insists that she have out bowls of nuts placed around the house and also in the foods served at the table. She won't listen to me when I explain the dangers. What can I do?" My heart went out to this woman because after all, it's her own mother that is telling her "No, I won't accommodate you or my grandson." Ouch. Many commenters (myself included) told her that she's not alone in this whole food allergy holiday meal thing and that she has to do what's in the best interest of her son. Other parents on the page (guessing not those who have kids with allergies because, of course, it seems simple if you don't deal with it yourself) said things like "Your mom's house/her rules" and "Just don't give the kid any nuts and it will be fine." Sound familiar? Therein lies the dilemma. Not everyone is going to understand your Thanksgiving food allergy concerns and most of us don't want to live in a cave far away from everyone. Is there a happy medium? More on that in a minute. Getting back to the parent of the two-year-old's question "What can I do?" Well, here's the thing. If she's spoken to her mother, which we can assume she probably has, what can she do? You can't force someone to listen to you, understand or accommodate you. You can't enforce rules in a house not your own. So, sadly, that parent may have to keep her son away from this gathering simply for his own safety -- and her sanity. I don't suggest this lightly, because I know that Thanksgiving is a time for the family to be together. However, nuts in a bowl is a deal-breaker if you've got a two-year-old. Two-year-olds think they're supposed to put everything in their mouths, even dishwasher pods. And you can't reason with them -- they don't have a good enough understanding of their allergy at this age. Even with older kids and adults/teens with allergies, nuts in a bowl is easily transferable from the hands of the person partaking to surfaces and edible substances. If you bring a separate meal from home for the allergic person (a not-so-great but feasible solution if you want to be with the entire fam), there is still danger if lots of nutty stuff is around. What if your family doesn't understand this and doesn't want to? Then it's up to you to do the right thing to keep your child out of the ER that day. In cases such as these, I know there is no perfect solution. Nobody is perfect -- not your family, not you. So why do we expect the holidays to go perfectly smoothly -- especially with a medically necessary food restriction like life-threatening nut allergies? It's too much pressure. Take it one meal at a time, one day at a time. As you learn the ropes and your family begins to understand what's at stake, it will get easier. If you're new to nut allergies this Thanksgiving, I suggest you take a deep breath and be good to yourself this holiday season. State your case, of course, but stay cool. You don't want your child to associate holidays with negativity -- it can create anxiety later on. Offer to bring food and offer to help figure out the menu. Many times, families are reluctant only because they don't understand how to make things "safe" for you. Let them know how they can help and make sure they know that you will do all you can, too. But what if, like the mom in the example above, you just can't get through to your family? Most of the time, if close family doesn't want to give a nod to your food allergy needs at the holidays, it points to a deeper issue going on with your relationship. Don't expect this to be resolved overnight and never let your child be endangered. Be strong and firm; be kind to yourself and to your family members. Food allergies are what they are; fighting won't make them go away. I have chapters devoted to communicating food allergy needs to others in my e-book, The New Nut-Free Mom. Click here to find it on Amazon; you can find other options for getting this book by looking at the right side bar of this site. I recently came across this cartoon online. I think it sums up how those with food allergies feel about any family meal: "It's not so much what's on the table that matters, as what's on the chairs." I say amen to that, but keep in mind that Thanksgiving foods are emotional for people. They want to be served what they remember and what they see as tradition. That's understandable but can be difficult to cope with when you're navigating a life-threatening food allergy. So if you find yourself in a situation like that, maybe you can start a new tradition of having people over during the Thanksgiving weekend, where you host and control what's served. Again, it's not perfect, but it's something. I have many posts about food allergies and Thanksgiving/holiday meals and I'll share those links at the end of this post. Plus, you'll find some of my favorite nut-free Thanksgiving recipes. Follow me on Pinterest to find more of those. What about you? How have you found ways of juggling Thanksgiving food expectations with food allergies? For all of us dealing with the imperfections of life with a food allergy at the holiday, remember: you're not alone. Do the best you can and try to celebrate the joy of the season. Be grateful for the food you can eat and the health of your loved ones. I wish you all a wonderful Thanksgiving! 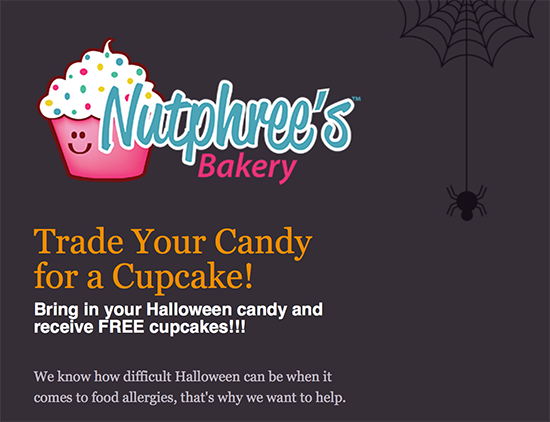 Chicago-Area Friends: Halloween Candy Trade-In at Nutphree's Cupcakes -- Last 2 Days! "We’re happy to be hosting our Trade Your Candy for a Cupcake program again this year. Kids can bring in their well-earned haul from Nov 1 through Nov 7 and take home a FREE cupcake or non-food treat! All candy collected will be sent overseas to deployed soldiers through Operation Gratitude." Nutphree's is open until 6 pm tomorrow, so if you can, head over there! Check their web site for more info. If you've never been in this bakery, you will be amazed at the beautiful nut-free cupcake and treat selection. I'm also happy to note that Nutphree's is bringing their cupcakes to several grocery stores in the Chicagoland area, including Whole Foods and Mariano's. THANK YOU Nutphree's for being such a caring (and delicious) resource to families dealing with nut allergies. Your baking creations are beautiful works of art and I appreciate all you do! What if you live elsewhere? If you have a similar buy-back program for Halloween candy in your area or if you have info on nut-free baked goods available near you, we want to know about it, especially with the holidays on the horizon. 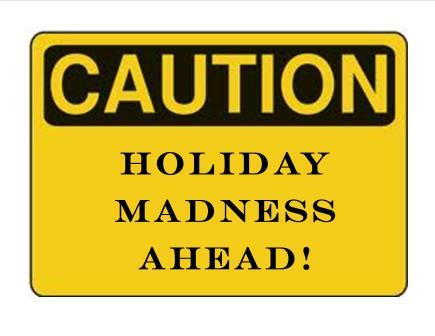 Even before Halloween, I saw a post about nut allergy issues on a local parenting mag web site, so I will be addressing the issue of dealing with holiday, social situations and nut allergies in the next few days on this blog. In the meantime, I've got lots of posts about Thanksgiving and nut allergies. Below you'll find two of the most popular; click the links below to read them. You can find even more articles, including nut-free Thanksgiving recipes, if you use key words in the search bar located in the upper left-hand corner of this site. And of course, if you haven't already, check out my e-book for encouragement and advice on navigating life with nut allergies. Halloween, Holidays and Nut Allergies: What's In Your Food? It's official: we've embarked on the holiday season. How do I know? Well, besides the fact that every store is screaming Halloween, with some Thanksgiving and Christmas creeping in on those side aisles, Love Actually was on TV this weekend and the Hallmark network is starting their Christmas movie season on October 31st! Yep, you read that right. I love the holidays but there is one thing that drives me a little bit nuts and that's, well, peanuts and tree nuts showing up in unexpected places. We can have lots of fun at this hectic time but we've got to be careful. No getting around it. This topic is something I've covered in my e-book and also touched on in several blog posts, but I don't think it's something I've covered recently here, in detail, so please bear with me. Basically, any food is up for grabs at this time of year. Well, this rule holds all year, but the fall and winter holiday season is the time that people break out the tree nuts, in particular. Peanuts also show up in all sorts of Halloween and other holiday candy. You've got to be vigilant with all the tasty treats out there and that includes candy, baked goods, savory dishes -- you name it. This is the best thing you can do: if you don't know what's in a food or can't identify an ingredient -- SKIP IT! I know it's not always fun, but it's the safest thing. And take heart, because there are so many good things out there right now. I'll include a couple of Halloween blog posts I've written at the end of this one for ideas. I hope everyone who is in the Chicago area is already partaking of Nutphree's awesome cupcakes (now available at Mariano's grocery stores). They will custom make stuff for you at their storefront bakery or buy ready-made at Mariano's. 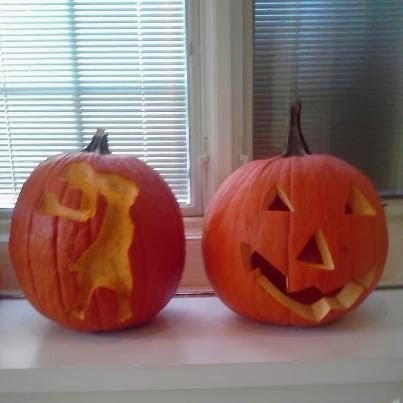 You can always decorate them. Remember, too, that all treats don't have to be sweets. This is a good slogan for the food-allergic and unfortunately, one I can't take credit for -- it was on the most recent Oriental Trading Company catalog. If you haven't perused that catalog in awhile, you can simply go online to their site for terrific non-food Halloween treats, party games and a lot more. Another thing I want to point out to not only the nut allergy newbies, but to everyone: not everything that contains peanuts or tree nuts is going to be obvious. So even if you've been doing this for a few years, be careful. I remember last year's Halloween treats bag. My younger daughter got a bunch of those old-fashioned candies called "Bit O' Honey." I never knew that they contained finely ground ALMONDS and only discovered that when I read the minuscule print on the side of the candy wrapper. I'm so glad they listed it but I've known about that candy for pretty much my entire life and never knew it had almonds. Learn from me: never assume a candy is nut-free unless you've checked it out personally. Marzipan - this is an almond paste used to make candy but also to decorate cakes -- it holds its shape and you can make elaborate cake decor with it. There's nothing in the name to suggest nuts, but they are there. Linzer Torte - this is a European fruit pastry (or cookie) with generally, almonds, in the crust. Avoid any torte for that matter -- "tortes" usually have tree nut flour as a large component of their ingredients. Flourless chocolate cake -- again these cakes may contain almond flour in place of wheat flour. Imported candy - some imported candy can be safe for nut allergies -- Haribo brand gummy bears are one example. However, a lot of the cute, different and fun stuff you find at say, World Market, or other stores along those lines is going to have at least tree nuts in the ingredients, especially the chocolates. Ferrero Rocher chocolates - these European chocolates have hazelnuts inside. Avoid them if you are allergic to tree nuts. Nougat - nougat means nuts! Avoid any candy containing nougat. 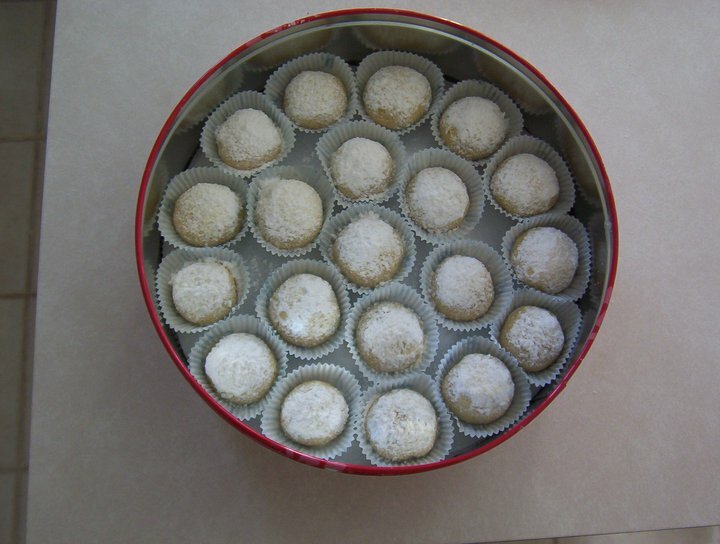 Truffles - some delicious nut-free truffles exist, such as those from Dean's Sweets and Vermont Nut Free. (I recommend both companies for nut-free chocolate.) However, your garden variety truffle either contains tree nuts or came into contact with them. Avoid them. 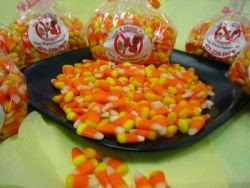 Bags of assorted Halloween candy - check the labels. Your favorite brands sometimes package differently at Halloween to include a candy assortment that includes stuff you can't have. So what is "safe" may be alongside candy like Reese's, creating cross-contact risk. Stick to the bags of candy that are all "nut-free" such as the assortments provided by Tootsie Roll company. All of their candies are tree nut-free, peanut-free and gluten-free. 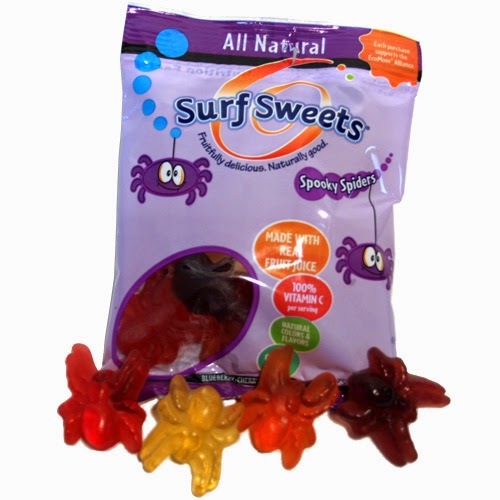 Please also see candies like the all-natural, nut-free and top-8 allergy-free "Surf Sweets" candy. You can learn more about them by clicking the image with the Spooky Spiders to the right of this post. This list is by no means complete -- you will have to look at everything you consume before serving it to a nut-allergic child or adult. However, I hope I've hammered home my point that many foods you or others might not think about may contain nut allergens and you can't ever assume that they don't without checking it out first. Now for a few Halloween posts from years past. Click the links to go directly to those articles. Nut-Free Haunted House Cakes and Nut-Free Candy Ideas - make an edible haunted house with a nut-free pumpkin cake recipe. Easy and delicious. If you're new to navigating life with nut allergies or just need a refresher, check out my handy guide: The New Nut-Free Mom. On Amazon, Nook or for your computer/iPad. Remember to consider all of your allergy needs before serving any food to an allergic person -- you are the best judge of your exact situation. For accurate, up-to-date information on foods and food labels, call the company directly.